Traditionally the systematic of the cyclopoid copepods, especially at generic level, has established on the structure and armature of the fifth leg (Kiefer 1927; Rylov 1948; Yeatman 1959; Dussart 1969; Monchenko 1974); particularly the structure of this leg is considered as the base character for the present systematic arrangement of the family Cyclopidae. 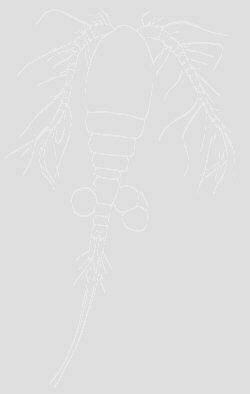 However, some authors (Lindberg 1954; Kiefer 1978; Morton 1985; Petkovski 1986) and recently Reid (1993) suggested that this appendage should be considered a somewhat conservative morphological character among the cyclopid copepods, as well as it could have a poor taxonomic value as generic discriminant: the fact is that this feature by itself greatly confuses the issue of definition of some genera which remain still vague and controversial (Reid 1994; Fiers et al. 1996). Moreover, the inadequacy of existing descriptions of numerous species and genera, as well as the recent discovery of several taxa combining morphological characteristics of different genera, such as Diacyclops Kiefer, 1927, Acanthocyclops Kiefer, 1927, Megacyclops Kiefer, 1927, Allocyclops Kiefer, 1932, Mesocyclops G. O. Sars, 1914 and Thermocyclops Kiefer, 1937, further complicate the taxonomic understanding of this group of microcrustaceans (Mazepova 1978; Monchenko 1985; Petkovski 1986; Boxshall et al. 1993; Reid 1993; Fiers et al. 1996). 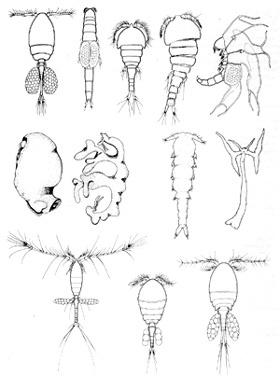 The present confusion among the Cyclopoid copepods is also largely due to the fact that certain fundamental micro-characters, such as the ornamentation of the antenna and antennula, and the armature of basis, coxa and couplers of the swimming legs, once considered unimportant, are often neglected in the specific descriptions and illustrations. 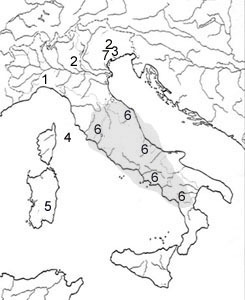 The Cyclopoids are the most abundant and successful group of copepods in continental fresh waters, such as running waters, lakes, ponds, temporary pools, as well as ground (hyporheic, phreatic, cave) waters. Many of them are marine and parasitic, as well. The order Cyclopoida includes 22 families: Archinotodelphyidae Lang, 1948; Ascidicolidae Thorell, 1859; Cucumaricolidae Bouligand & Delamare-Deboutteville, 1959; Cylopettidae Martinez Arbizu (in press); Cyclopicinidae Martinez Arbizu (in press); Cyclopidae Rafinesque, 1815; , Cyclopinidae Sars, 1913; Fratiidae Ho, Conradi & Lopez-Gonzalez, 1998; Giselinidae Martinez Arbizu (in press); Hemicyclopinidae Martinez Arbizu (in press); Lernaeidae Cobbold, 1879; Mantridae Leigh-Sharpe, 1934; Notodelphyidae Dana, 1853; Oithonidae Dana, 1853; Ozmanidae Ho & Thatcher, 1989; Psammocyclopinidae Martinez Arbizu (in press); Pterinopsyllidae Kiefer, 1927; Schminkepinellidae Martinez Arbizu (in press); Smirnovipinidae Martinez Arbizu (in press); Speleoithonidae Rocha & Iliffe, 1991; Thaumatopsyllidae Sars, 1913; Thespesiopsylldae Wilson, 1924. The order presently includes about 1200 named species and subspecies, more than half belonging to the successful, widespread family Cyclopidae. Thermocyclops oithonides (G.O. Sars 1863) S?